After arriving at our La Jolla | UTC based clinic you will be met at reception by Leeann Gade, Dr. Berkoff’s front office manager. She is your link to our office and your advocate. Leeann is available to help you sort out any questions or concerns you might have regarding insurance, costs, or methods of billing, and to assist you in scheduling appointments, arranging for testing, and coordinating your care with other doctors. Prior to your first visit, Leeann can email or fax to you our patient intake forms and any other items you might need to make your initial check-in process easier. Coverage for chiropractic care is included in many health insurance plans. Our doctors are participating providers with many insurance companies. We also accept Medicare, Workmen's compensation and Tricare for active duty military (referral from PCP is required). Our chiropractic office is also one of the few in network providers with Covered CA PPO's plans from Blue Shield and Healthnet. Please let us know ahead of time if you have been injured due to an automobile accident. Many auto insurances policies include a provision for 'Med-Pay' which covers treatment for injuries resulting from an auto accident (regardless of who was at fault). If your policy contains this provision you may be able to receive care with no out of pocket cost. Not sure if you have Med Pay? We are happy to assist you in finding out. We are here to guide you through the sometimes stressful process of determining benefits. Helping you lower stress aids in your recovery. Your initial appointment with Dr. Berkoff is typically up to one hour long. Subsequent follow-up visits run 20 minutes, and the doctor makes it a point to try to stay on-time. Our schedule is usually fully booked, so your being prompt helps him to maximize the amount of time he can spend with you and to stay on-time for each subsequent patient. Dr. Berkoff approaches his practice with the assumption that good medical care begins with an accurate diagnosis. Your first visit will include a detailed history and examination. Dr. Berkoff’s extensive training in sports medicine, nutrition, orthopedics, and neurology means that he will be interested in various aspects of your health and well-being. As he gets to know you he will learn whether your goals are limited to a specific complaint or if they might include general health issues such as diet, weight loss, exercise, peak-performance training, stress-reduction, or a number of other areas in which he has interest and expertise. Depending upon the nature of your problem, you may be asked to change into a patient gown. Modest persons are encouraged to bring a pair of athletic shorts but this is not required. Following the history and physical examination, Dr. Berkoff will give you his report of findings. If more information is required in order to make a diagnosis, he will discuss that with you. Leeann will help you to arrange any necessary specialist consultations or additional testing. Often times the history and examination are sufficient and a clear diagnosis can be made during the first visit, enabling the doctor to discuss with you his proposed plan of treatment. 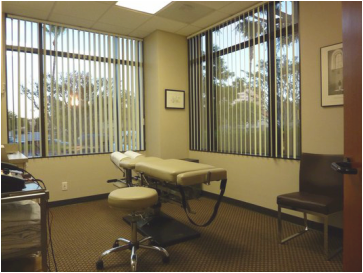 Dr. Berkoff utilizes various physiotherapy modalities, including ultrasound, strength conditioning, electrical stimulation, and traction, as well as traditional chiropractic manipulation treatments. He is also certified in Active Release Treatment (A.R.T. ), Dynamic Spinal Stretching (Bamboo Method), and in myofascial release therapy (spray and stretch), and has been trained by the originators of each of those techniques. In most cases, the one hour initial appointment permits enough time to begin treatment.